You’re a gluten-free gal. A cute one, too, no doubt. But your puppies? Their definitely cute, but gluten-free? Probably not, huh? It’s time to upgrade your dog chow to something that fits YOUR glamorous and green gluten-free life by switching to gluten-free dog food! Think about it: You work so hard to eat gluten-free, order gluten-free in restaurants or when you go over to your friends houses, and to avoid all contamination with food tools and appliances. Does it freak you out as much as me when you’re dog’s munching on poison-filled bites all over your bed, couch, and floor (getting gluten-filled crumbs all over the place)? Sometimes I worry about kissing the tops of my little dogs’ heads. 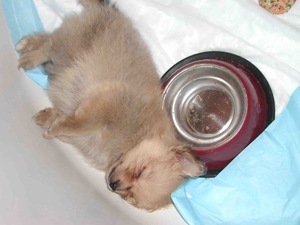 As precious my two Pomeranian pups are, I just don’t trust their personal cleanliness. But let me tell you: It’s difficult to find all-natural, gluten-free dog foods out there! That’s why I was over-the-moon when Glamour and Green found one (that’s fabulous, of course! 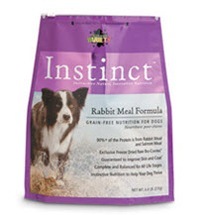 ): Nature Variety’s Instinct Line of Grain-Free Kibble for Dogs! Now you can feel comfortable kissing your pampered pooches (still, I hope it’s not on the mouth 🙂 ), picking up their spilled doggy food, or letting them happily munch away all over and around your furniture (and everything else) without needing a contamination space suit! Whoo-hoo! 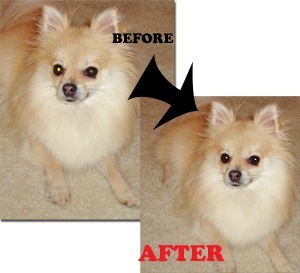 Also, if your camera-happy like me and loooove taking photos of your pups, learn how to remove that nasty-looking green pet-eye in Photoshop Elements! Take the Digital Scrapbooks and More Photo Editing Tutorials, and learn how you can make your dogs look cute & cuddly again in their pics!